Weddings are interesting event. This is the time when you reunite with your whole family. Sometimes, kids presence is not included in the invitation. It is quite okay if someone decides to do this. Think of it as a good intention, as they want to spend good time with you. This is the case when only Mr and Mrs is written on the envelope. If the invite is addressed to the whole family, then this means that you are all invited including your little ones. Does the idea of going to a wedding with your kids scare you? They are all cute and dressed nicely, but we know that kids are unpredictable. They might get bored, hungry, sleepy, or shy. The excitement from wearing cute flower girl dresses can be suddenly turned to a tantrum. Attending an event with lots of people can be stressful for them. But luckily, there are lots of ways in which you can make them comfortable. Many couples that plan weddings want to include children in the ceremony. This is a fun part, where kids can feel like they are a part of the wedding. 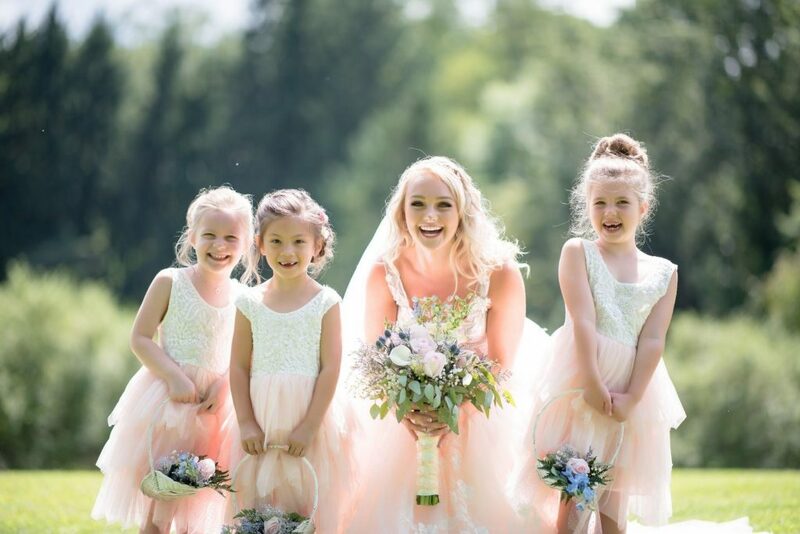 Flower girls and ring bearers will add a dose of cuteness to any ceremony. Close family members and friends can invite your daughter as a flower girl. This means that she will have to walk down the aisle and spread petals on the way. This activity can be a little challenging for small children that can’t stay in one place only. So, make sure that you do a little explanation of what her duties will be. As soon as the bride informs you, start browsing for cheap flower girl dresses online. Boys can have the proud role of a ring bearer. His main task will be to bring a cushion with the rings to the ceremony. He will walk down the aisle holding them. Usually, both of the ring bearer and flower girl go together. Do not worry that your kid might lose two expensive rings, as they are given fake ones. It is all about including the young family members and bring fun to otherwise boring ceremonies. Kids can be easily bored around adults. When a wedding with children as guests is planned, it is likely that the bride and groom will have this in mind. Often, they can include a candy bar or some sort of entertainment for the kids. Look for a corner with goodies to keep them entertained. A small table might have wands for blowing bubbles, candies, coloring books, and even toys. The most risky part is the ceremony. Kids find it so boring. Try to keep them entertained during these times.